Although it holds a place of honor in the pantheon of logic-defying sequels, Die Hard 2 is now, several sequels later, the most “logical” (relatively speaking) of the film series that chronicles John McClane’s Forrest Gump-like ability to wander into terrorist situations. Emulating its predecessor, Die Hard 2 set the action on Christmas Eve, based its plot on a novel (Walter Wager’s 58 Minutes), and imported some terrorists who weren’t quite what they seemed. The film’s tagline, “DIE HARDER,” pretty much said it all. It’s like the original, only with more! At the dawn of the ’90s, Renny Harlin seemed best qualified to bring that vision, so to speak, to life. He’d done that exact thing with another sequel, 1988’s A Nightmare On Elm Street 4: The Dream Master, which earned $49 million and set a franchise record at the box office. Although he’d later be known for the über-flop Cutthroat Island and a scandal with his personal assistant that ended his marriage to Geena Davis, it didn’t seem crazy at the time for 20th Century Fox to double down on Harlin. The studio hired him to direct two high-profile films at the same time: the Die Hard sequel and The Adventures of Ford Fairlane, a starring vehicle for comedian Andrew Dice Clay. The movies were released a week apart in July of 1990. Die Hard 2 finds McClane visiting his in-laws in Washington, D.C., for Christmas. When he goes to pick up his wife at Dulles airport, he stumbles into a terrorist plot to free a disgraced South American strongman, who’s en route there as a prisoner on a U.S. government plane. 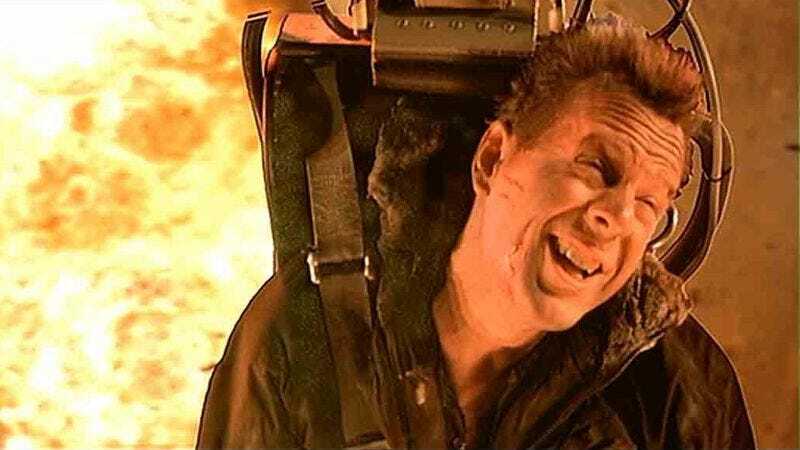 The original Die Hard showed how clever and ruthlessly efficient action films could be, but Die Hard 2 reduced those smarts and added more action setpieces and smirking zingers from Bruce Willis. The zingers don’t add much, but some of the setpieces are pretty great, like a tense build-up to the terrorists bringing down a plane, and a ludicrous scene in which McClane ejects out of a grounded aircraft. Die Hard 2 also gets a boost from great supporting players, such as Dennis Franz as an antagonistic cop, John Amos as a special forces double agent, and—in an excellent turn—William Sadler as the terrorist ringleader. William Atherton also returns as boorish journalist Richard Thornburg, who happens to be on Holly’s flight. Die Hard 2 may sell out what makes the original Die Hard so perfect, but it succeeds as a big, mildly clever action flick, a bar no subsequent Die Hard film has aspired to surpass. Nothing could ever top the original, but the first sequel is enjoyable all the same. Availability: DVD and Blu-ray, and rental or purchase from every digital provider except Netflix, where it’s only available on DVD.